← Welcome to Pepe’s Vegetarian Restaurant! Rice,beans,potato,zucchini,onion,bell pepper,ranchero sauce,pico de gallo,corn tortilla chips and cashew crema. Fresh baked torta bread from Pan Dulce layered with mustard,pickles,our home made vegan patty,vegan pepper cheese,fresh guacamole,organic greens,pico de gallo and cashew crema. 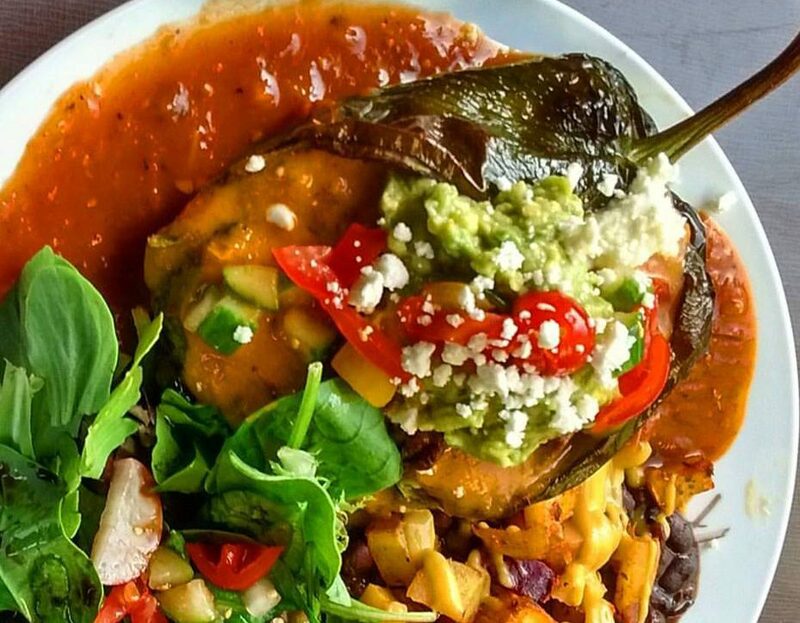 Poblano pepper stuffed with wild rice,mushrooms,spinach,tomato,blackened tempeh and vegan cheese. Covered with ranchero sauce,cashew crema,fresh guacamole and pico de gallo. Served on a bed of black beans and fresh organic greens. Large flour tortilla filled with our delicious house made red beet hummus,pico de gallo,sunflower seeds,organic greens and pomegranite vinaigrette.Make it gluten free by omitting tortilla. Flour tortilla layered with baked sweet potato,black beans,sweet pepper,onion,served with organic greens,pico de gallo,beans,rice and guacamole. Three red chile corn *tortillas stuffed with a rotating yummy filling,chile lime cabbage,pico de gallo and fresh guacamole. *Proudly using fresh local made tortillas from Marlene’s (25/Randolph) 10 years and counting. Dinner special every Friday night. Please check our grab and go cooler for goodies to stock your fridge!